Butter is back research reveals that there is no clear benefit changing to margarine. Updated on 7th April, 2019. When there is contradictory research about a matter, it means that scientists just don't know the answer. They haven't come up with conclusive evidence either for or against dairy products, for example. So it is for milk and cream. Selective reporting can prove that it's bad, or good, depending on which axe you are grinding. A group of scientists reporting in the prestigious Annals of Internal Medicine, after doing what is known as a meta analysis of nearly 80 trials and studies, following over half a million patients, came to some very interesting conclusions. In short, there is absolutely no clear evidence that eating a diet low in saturated fats like butter, cheese and animal fat makes you less vulnerable to heart and blood vessel disease. And the corollary, there is no evidence that a diet high in polyunsaturated fats like margarine gives you protection against cardiovascular disease. The margarine industry's emphatic advertising that changing from butter to margarine will protect your heart is utterly spurious; it's based on selective reporting. There is an equal amount of research proving just the contrary. What was clear from observational studies was that monounsaturates from olive oil and avocados were the most protective; and trans fatty acids in hydrogenated foods were the most damaging. 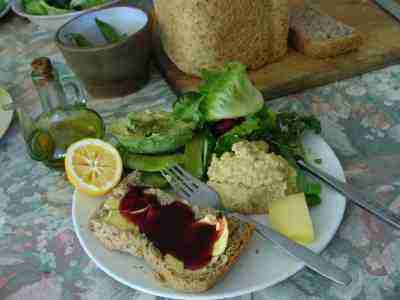 You can have your butter and eat it providing you are enjoying a lunch like this. But if you are on one of the many ketogenic diets I'd father rather see you increasing the olive oil and avocados. I have serious difficulties that make no distinction between white bread, and that made with 100% real flour, for example; chalk and cheese. Healthy choice foods mean you can have your butter and eat it providing you are enjoying a lunch like this; thank God margarine is history and butter is back. Research at heart stroke diabetes confirms the importance of salads, whole grains like this 100% wholemeal bread, and the freshly ground nuts and seeds that we add; it also has half the salt, the most vital factor in these preventable diseases. We do a lot of bread experiments with our cooking; for example the dough rises far better when using honey rather than sugar for the yeast; baking with wholemeal is fun. 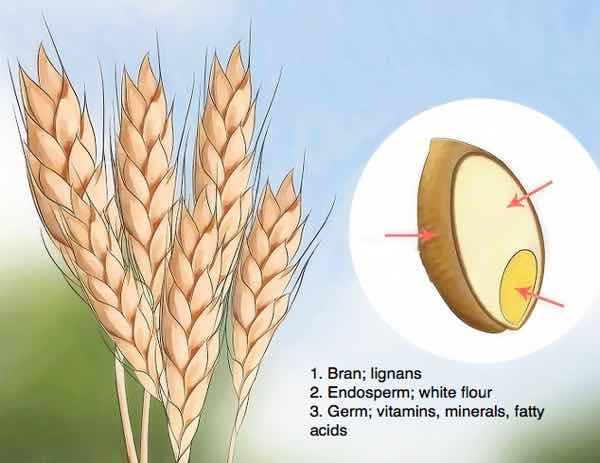 The food companies love it when you buy the refined white flour, the bran for the breast-cancer preventing lignans and the vitamins, minerals and fatty acid supplements separately; their profits soar; rather enjoy whole foods. Read about labeling from the whole grains council. Butter is back asks whether our taste buds weren't right all along? It's safe provided we're enjoying our greens too. Notice the olive oil decanter; fruit oils are mainly monounsaturated which is why the people of the Mediterranean have a lower incidence of heart disease. Well, there may be other reasons too. Let's just say that it's one of the reasons. Extra virgin olive oil is rich in phytosterols; compounds that have a very similar structure to animal cholesterol, and compete with them for absorption. Lower down you'll find a link giving more information about what are phytosterols. Or, use the search this site function in the navigation bar. Notice too the bread and butter, and a block of cheese; all eaten without guilt. Butter is back is the new buzzword. What are trans fats? Vegetable oils in nature are made of what is known as the cis isomer. They are liquid. Obviously, you can't easily smear a liquid on your bread so the food manufacturers have come up with a solution; hydrogenate the oil, turning half the fat into the trans isomer. They have a much lower melting point and are solid at room temperature. Margarines, with a very few exceptions, are fifty percent trans fat. There are no trans fats in nature; they are man made and are closer to plastic, and certainly shouldn't be called a food. The particular interest to a chiropractor, consumed with healthy living, is that our nerves are coated in a myelin sheath that is mainly fat. Without it, nerves will not conduct. The serious neurological diseases like multiple sclerosis are called demyelinating illnesses; they strip the fatty sheath from our nerves. We think it vital that our nerves are coated in normal fat, and not plastic, though I must add I know of no research indicating a connection between trans fats and neurological diseases. It's very irritating that food manufacturers now add hydrogenated oils even to healthy foods like peanut butter and marmite, so that they are less runny won't separate as easily. Read labels and avoid hydrogenated foods. On the other side, let's recognize that there is indeed strong evidence linking saturated animal fat with heart disease; this is particularly true when that diet is associated with abdominal obesity and a poor overall menu. And it's certainly also significant when it's meat and potatoes which are also low in those phytosterols; starches like spuds are known to have a very high glycemic index. They turn rapidly into glucose in the blood stream. In the absence of salad and fruit in the diet, the so called phytochemical foods which compete with dietary cholesterol, high GI starches raise the low density fats and blood sugar which does not make for a heart friendly combination. Butter is also a good source of beta-carotene, an important phytochemical that is the precursor to vitamin A. It's just another way, along with the yellow foods like carrots and butternut to make we don't develop a serious beta-carotene deficiency. New potatoes are the exception; enjoying them before the tops are sprayed with herbicide, and within three days of being harvested, does not cause the spike in blood glucose. There were two other exceptions to these vague and contradictory findings. Margaric acid, the saturated fat in butter, was actually associated with a lower rate of heart disease. Don't think, because of its name, that it is poly based; it's straight from the cow and has nothing to do with margarine. The omega 6 polyunsaturated fatty acids found in many seed oils and particularly in processed foods were linked to an increased risk of cardiovascular illnesses. On the other hand, in contradiction with other research, there was little to confirm the protection of fatty fish and flax seed. Their conclusions are likely to confuse you, just as they've disturbed the medical world. Another researcher adds that there is little data to support previous guidelines recommending that we eat less saturated fat and more carbohydrate. The glycemic index of winter squash is around the moderately low 50 mark. Butter is back, so add a dab to your food and you'll lower it even further. What do we make of all this? Clearly scientists are not convinced that low fat is associated with a healthier heart; and, when combined with high carbohydrate, and low fatty acid plate it's definitely associated with serious neurological diseases. Further, a high saturated fat diet is also not absolutely linked to heart conditions. There are other factors at work. Certainly it would seem we can enjoy coconut oil, high in saturated fat, without any doubts. There's a new fad doing the rounds called the banting diet; it has some merit in that its research removes the now unsubstantiated fear of animal fats. I go along with that suggestion provided you are eating plenty of fruit and salad. Where I differ with them is that they forbid fruit like apples and vegetables like butternut, except in very limited quantities, because of their carbohydrate content. They haven't for example separated those eating butter along with a meat and potatoes diet, from those enjoying fruit of the cow with a high salad and fruit plate. Make what you will of all this, but I'll stick to plenty of animal fat, with no fears because of a good body mass index and also our added varied, ten colours diet; plenty of beetroot and broccoli, sweet potatoes and spinach, pecan nuts and flaxseed, apples and grapes. 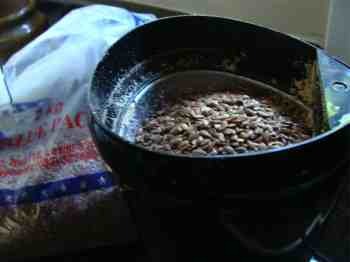 Grinding flax seeds is vitally important; otherwise they are not digested, and pass straight through the bowel. For the carnivores amongst us, the options on omega 3 are easy; fatty fish like salmon and sardines are fairly easy to get. But for vegetarians, the only simple source of large amounts of omega 3 is from grinding flax seeds yourself and adding them immediately to your breakfast cereal. The oils are oxidised as soon as the hull is cracked; they go rancid. Freshly cracked walnuts are great too. Fish and flax actually produce different omega 3 fatty acids; it's best really to have both, then you can be sure of getting all the right fats. From the whole seed, because of the added benefits of lignans and other phytochemicals; it's far more beneficial than flax seed oil. Butter also has an admittedly small amount of omega-3 but what is good is the 1-1 ratio with omega-6. Butter is not inflammatory like margarine is. These fatty acids then are carried in the bloodstream and stored as triglycerides. Olive oil benefits are broadly acknowledged, provided it's not processed; look for oil that burns at the back of the throat. Not an alternative to butter is back, but in addition to. Recognising that the science is giving us very confusing signals, one needs to follow our own instincts. One of those is that olive oil was never away, and so needn't come back; it's here to stay. But do choose the unprocessed extra virgin; it has the phytosterols that are so vital. Whenever we start processing a food, it loses something. The monounsaturated fatty acids of olives and avocados answer the question what is oleic acid making them Queen of the Mountain. Panera bread menu recipe is so easy with the help of a bread machine. Bread and butter has been a staple since time immemorial, but there are numerous problems associated with store bread. It's loaded with chemicals, sugar and salt. Bread has a high glycemic index; it's turned rapidly into blood sugar giving an unhealthy insulin rush; that makes it fattening too. There's only one solution that I can think of; buy a breadmaker with a five hour cycle and spend five minutes every day baking your own panera bread menu recipe; that's all it takes. Better still, add some protein and butter and then you have low GI bread. Butter is back; in your bread and on it. Adding homemade dips made with cream cheese and olive oil will lower the GI even further. Just the smell of baking bread makes it all worth while. If you are seriously overweight, then I go along with most of the tenets but have some doubts; read Banting diet rebuttal if you're interested; that means little or no bread until your BMI is under thirty. One of its big virtues is that you aren't constantly hungry whilst dieting; quite the contrary, you feel satiated. Hydrogenated foods are highly toxic; it's a mercy that butter is back. We alluded above to the dangers of trans isomers; they are manufactured by hydrogenating healthy cis fat to make them solid at room temperature. The problem is that hydrogenated foods are very dangerous for your health; scientists all agree so there is no confusion. Margarine will not be back. Anything that tastes as bad must be awful. Butter is back without a doubt, unlimited in my book, but only if you are eating a diet rich in vegetables, fruits and salads; the orange in butternut, the greens in lettuce and broccoli and the purples in mulberries and beets. Whilst I don't believe we can yet confidently describe butter as a healthy choice food, it's certainly not as bad as margarine and a century ago, when our forebears were eating plenty of natural foods and animal fat there wasn't the cardiovascular disease of today. Olive Oil Benefits surpass those of butter.